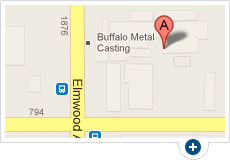 Since 1975 Buffalo Metal Casting has been a leading supplier of brass cast parts. We are a single-source supplier for all of your brass casting needs. We offer a wide range of services to fit exactly what you need, and we have the expertise to get the job done right. When you work with Buffalo Metal Casting, you'll receive results of the highest quality. Because of our well-equipped facilities and highly capable furnaces, we can cast parts in any commercially available type of brass. We have the following alloys available for brass casting: C83600, C86500, C90200, C90300, C90500, C90700, C91600, C95400, and C95500. To create parts for our clients in the most efficient and effective manor, we offer a wide variety of sand casting methods. Below are the methods available for casting your brass part. Permanent Mold: This brass casting process involves casting the part in a reusable mold made of metal. Green Sand Brass Casting: Best for medium and small castings, in this process parts are cast in reusable molds made from sand clay, water, and flour. No-Bake Sand: For medium to large sized parts, this process uses molds created from sand and resin mixed with hardening catalysts. This process creates an improved finish on the final brass casting product. Precision Shell Sand Brass Casting: Also best for medium and small parts, this process employs disposable sand blown onto heated iron patterns to create molds for your casting. Harrison Flaskless Matchplate Mold Machine: This machine creates molds that use the green sand casting method. When you need a brass casting or brass part created, call the experts at Buffalo Metal Casting. We work affordably and efficiently, and we're sure you'll be 100% satisfied. Call now or request your free quote today! Request A Brass Casting Quote!